If you can stop laughing long enough, you may learn a thing or two about yourself and others from Maybe You Should Talk to Someone, which is part memoir and part on-the-page therapy. What makes this book a joy to read is that it offers a wise and witty meld of the author’s personal insights and clinical observations plus bite-sized nuggets of psychology without ever lecturing or boring the reader. We are fortunate that Gottlieb decided to write this book, a decision that came about through the experiences she details in it. Lori Gottlieb takes you not only inside the head of a therapist but welcomes you into her heart as well. For those who are skeptical, fearful or turned off by the idea of the talking cure, this fly-on-the-wall view of the subject just might convince you that therapy is remarkably worthwhile. Gottlieb’s devotion, determination and effort to help her patients, along with their courage to take risks to heal and grow, illustrates how the therapeutic process is like no other. For self-help aficionados, there is wisdom galore on topics such as the drivers and inhibitors of psychological transformation, managing loss and grief, discovering meaning in life and work, distinguishing between pain and suffering, and the traits that are essential in forging intimate relationships. And for therapists, there is the chance to sit back and take note of how another clinician applies her skills to conjure up the magic of effective therapy. One strand of this memoir is set in motion by a mystery of the why-done-it variety: What made Gottlieb’s long-term significant other, whom she refers to as Boyfriend, suddenly break up with her because he’s come to the regrettable, albeit belated, conclusion that he doesn’t care to parent her son from her previous marriage—though he knew from the get go that they were a package deal. Depressed and distraught by Boyfriend’s seemingly out-of-the-blue abandonment and betrayal and struggling with gnawing what-do-I-want-to-do-with-my-life-now-that-I’ve-grown-up anxieties, Gottlieb bites the bullet and decides to enter therapy. As we learn more about her personal and work history and her relationship with Boyfriend, we come to see her as a person first and as a therapist second. A talented and highly accomplished writer, Gottlieb’s insecurities and chronic internal conflicts may surprise some readers. The fact that she doesn’t hold back talking about her suffering is what makes this book so powerful. The more authentic she becomes, the more we like and identify with her. The harder we root for her to grow and heal from her pain, the more she inspires us to do the same. A second strand of this book is about the happenings within the therapy hour. Gottlieb welcomes us in, gently closes the door behind us, and invites us to become thoroughly acquainted with a select few of her patients. Rather than feel as if we’re eavesdropping, we feel privileged to bear witness to the authenticity, bravery, caring, tenderness, intimacy, and depth of emotion we observe. We see her patients initially through her eyes and then, as their stories evolve, through their own widening self-views. They become mirrors to help us see ourselves more clearly: the games of emotional hide-and-seek we all play with ourselves and others, the pain and joy of opening our minds and hearts, and the terror and longing we feel to let our unvarnished selves step out from behind the curtain. We can’t help but became attached to Gottlieb’s patients, as she grows to love and accept them and as they, eventually, grow to love and accept themselves. Woven into her clinical observations are teaching moments: which early attachment styles lead to relational problems down the road, how the defense mechanism of displacement leads us astray, what makes the “rupture and repair” process so therapeutic in developing trust and intimacy, what mourning entails and why it never works to try to simply “get over” losses, why “flights into health” can feel so good while being so deceptively dangerous, and how therapists consciously employ silence to stop the flow of verbiage that Gottlieb calls “tossing junk into the void” in order to encourage patients to access their deeper, hidden feelings. A third strand woven throughout Gottlieb’s story involves what it’s like for therapists to seek and submit to counseling and therefore switch from being the questioner to the questioned. Through Gottlieb’s slow-cooker relationship with her oddly compelling therapist, Wendell, readers get a chance to feel what patients experience in therapy—wanting both to settle in and run away, wishing and waiting to be healed, and cautiously turning themselves inside out to reveal their naked vulnerabilities to another human being as well as to themselves. Because therapists are used to being in the driver’s seat, we learn how this complicates the ability in therapy to move into the passenger seat and be driven around by someone else, as well as how psychological shifts cannot happen any other way. Gottlieb does not shy away from questions which might make even seasoned therapists squirm. What can be done when one party in the therapeutic relationship has romantic or sexual feelings about the other party (patient to therapist, therapist to patient, therapist to her therapist)? How do therapists decide which personal information to reveal to patients? Does it really matter who says hello first when a patient bumps into his or her therapist in public? 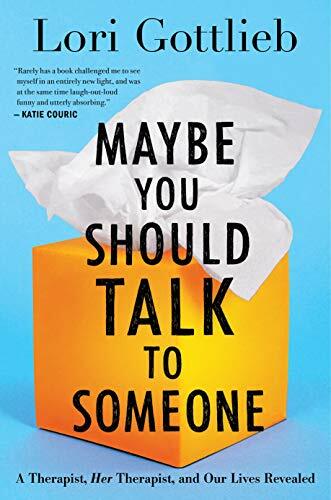 Gottlieb is so generous about her personal revelations that readers might be left wishing to learn more about what happened in her childhood, within her family, to better understand how she got into the muddles she did and ended up in therapy. Aside from this omission, this book is a most satisfying and illuminating read for psychotherapy patients, their therapists, and all the rest of us.